I’m currently developing a SharePoint 2013 application. 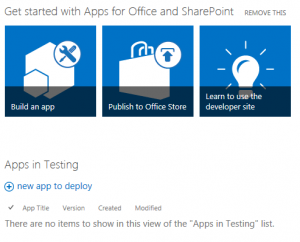 After a few deployments via Visual Studio, I was suddenly confronted with the error “Error occurred in deployment step ‘Install App for SharePoint’: The provided App differs from another App with the same version and product ID’”. According to Visual Studio the App didn’t need to be uninstalled. But once the App is uploaded, SharePoint figures out that there still is an instance of the App. A first visual inspection of the SharePoint Application site, indeed shows an empty application (test) gallery. After some further investigation, it turns out that the application is still visible via the “Site Content” overview. How nice, they even show a message that the app couldn’t be uninstalled! Luckily there is also a link to retry the uninstallation. 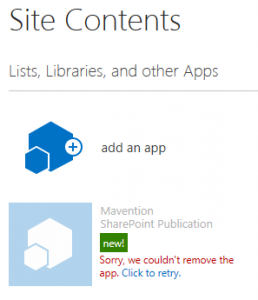 By clicking the link “Click to retry”, SharePoint indeed initiates another uninstall. After some waiting the app is successfully removed and the deployment via Visual Studio works again as it should! I am getting the same error “The provided App differs from another App with the same version and product ID.” but even for the first time i am getting this error. Below is my output window while i am deploying the custom app. Don’t know how to solve this issue. …indeed! It was in the Site Contents with some obscure red error message next to it that I didn’t even bother to read. I want to rant more, but just thank you.